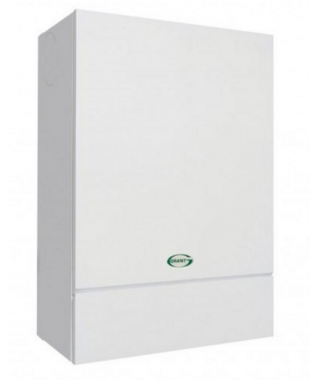 The Vortex Eco Internal Wall Hung Regular oil boiler is a condensing boiler that has been designed and manufactured by Grant. It is a wall hung boiler that has been designed to be placed indoors with a high efficiency rating of 90.1%. This makes the unit A rated and with an output rating of 16-21kW is perfect for the smaller homes where there is not such a high demand for heating and hot water. This boiler features an award winning condensing heat exchanger and wall mountable multi directional flue that is factory fitted. It also has a removable control box, an Ecoflam MAX1 burner and internal condensate trap with external options available. This highly reliable boiler is exceptionally quiet in operation and available in a variety of outputs ranging from 12-21kW. As a Regular boiler is incorporates extended controls and a hot water cylinder which is often fed by a cold water storage cistern and a feed and expansion cistern located in the loft. You’ll receive a 5 year warranty with this unit so you can rest assured that you have purchased a boiler that won't let you down.